It is difficult to overstate the importance of having excellent credit in the world we live in today. Fantastic credit permits individuals to make rental leases, borrow money for competitive interest rates, and even enjoy lower premiums on car and life insurance. There are a number of people who suffered credit problems because of the Global Financial Crisis, Great Recession, and aftermath and who have poor credit as a result. Young adults and students also may have never used or have credit because they simply ignored it. For whatever reason, individuals find themselves in need of credit and a means to build it up fairly quickly. Self Lender is a service that addresses these needs with a proactive approach. Self Lender turns out to be a free credit sore monitoring operation. It offers members who need to build a credit history their own Credit Builder Account and others with stronger credit a personal loan and credit card offers’ portal via Credible. Here we consider Self Lender’s more unique Credit Builder Account Service. Who Does Credit Builder Help? What Is A Credit Builder Account Exactly? Is the Self Lender Credit Builder Account Provided Free of Charge? Is Self Lender a good idea? Is Self Lender a scam? What is a Self Lender account? Does Self Lender have an app? How to cash a Self Lender check? What Self Lender loan amount is best? How long has Self Lender been in business? Can I extend my loan in Self Lender? When do I get my Self Lender loan? When does my payment post on Self Lender? Do you get a grace period for Self Lender? Can I pay off Self Lender early? How long does Self Lender take to mail check? How will Self Lender give me my money? Can you make double payments on Self Lender? What is the age requirement to open a Self Lender account? What happens after I complete my Self Lender payments? 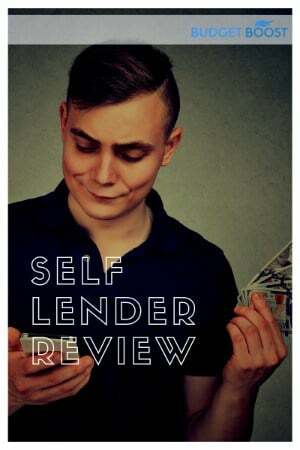 Is Self Lender a subprime? Does Self Lender pull up credit history? How accurate is Self Lender credit score? How long does it take for Self Lender to report? How much does Self Lender help your credit score? Does Self Lender help credit scores? When does Self Lender report? Does Self Lender raise your credit utilization? Who does Self Lender report to? Can Self Lender report late payments? Does Self Lender give you all three scores from credit bureaus? Credit Builder is ideally geared towards individuals who are struggling with either little to no credit or poor credit. They are able to do this because Self Lender possesses a number of key, one of a kind relationships with a range of commercial banks. The core of their Credit Builder Accounts stems from these banking partnerships. 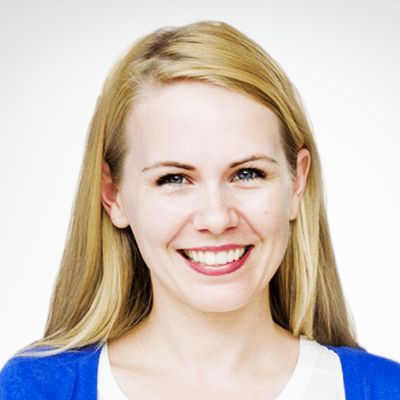 Installment loans are what Credit Builder offers to help these individuals establish good credit. Self Lender offers the unique advantage of no credit check, making it one of the few options for people with really bad credit. Their only financial background check is to ensure that participants in the program have not closed checking accounts through fraud. Understanding what a Credit Builder Account exactly is requires a bit of nontraditional thinking. This is because Self Lender’s Credit Builder is actually a reverse loan. Individuals who participate first make the payments, then they receive the money later. Because of the loan structure and monthly payments setup, participants build up credit history with every payment on the account. A crucial point is that the service does report all timely (or otherwise) loan payments to the Equifax, Experian, and Trans Union credit bureaus (the famed “Big Three”). This makes it certain that the loan will appear on a customer’s credit report in short order. One way to look at this is like a mandatory savings program. The motivation to make the appropriate, agreed upon payments is real as the savings are not disbursed until the end of the repayment process. Yet the reality is that this is still a relatively low cost loan. What makes it unique is that clients effectively are loaning the money to themselves in an effort to build credit and force on themselves a savings plan at the same time. This is not a free service though, so it is important to understand how it works and what is involved before jumping in enthusiastically. The question comes up: How much of a difference will Self Lender’s Credit Builder loan make to the customers’ credit? The clients of Self Lender have reported experiencing increases in credit scores on average of from 30 points to 60 points. A few have benefited more, with gains reaching up to 100 points. The end result is appreciably more than simply a significant boost to underlying credit score though. The customers also receive a fully matured CD at the end of the payment term. Prepayment of the loan at no penalty is also permitted. Yet the most effective results of improved credit scores from the program come from continuously ensuring all loan payments go in on time. It is important to remember that such a credit building program has two sides to it. For those who make the payments on time, the rewards are a good credit history and the resulting rising credit scores. Conversely those who are late with their payments will have delinquent or late payments reported to the big three bureaus and watch their credit scores decline apace. Credit rebuilding services are rarely free, and Self Lender’s Credit Builder Account is no exception. The participants are actually loaning money to themselves, yet pay as much as 16 percent in interest rate charges for the self loan. On top of this, Self Lender gets a from $9 to $15 account opening “administration fee.” The exact amount depends on the type and loan amount. This product and service delivers the goods on what it promised. For those who follow the program by making their payments on time, their credit scores will improve from 30 to 60 points or even by as high as 100 points. Users should remember that this is not a for-free service though. Costs to open and fund this account range from $46 on up to $112. Other cheaper options for building or rebuilding credit do exist. Alternatively, individuals could open a secured credit card or even ask to be made an authorized user on an existing family member’s credit card. It is unlikely that these less expensive methods would improve the person’s credit score as significantly as does the Self Loan Credit Builder Account though. Get a good overview of Self Lender and how you can open up an account in our short guide. 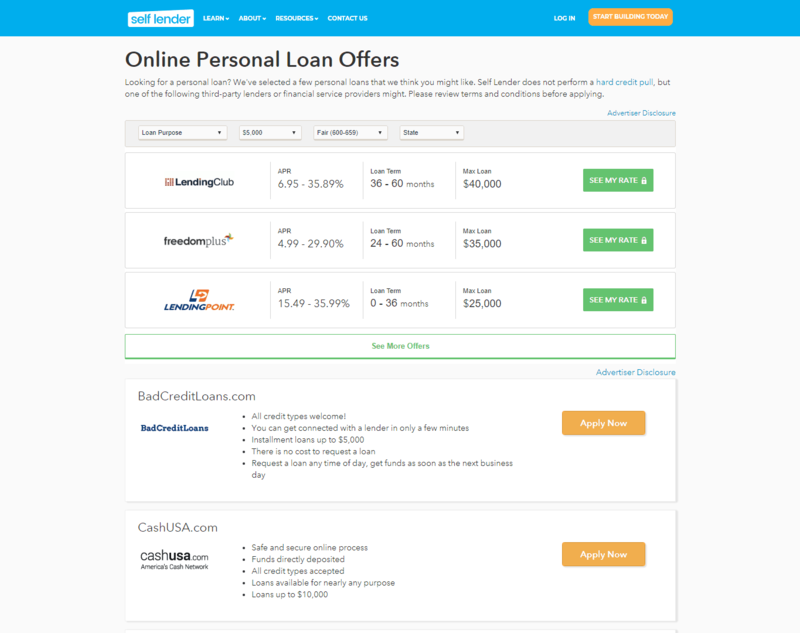 Self Lender is an alternative form of lending that helps you build your credit rating. Since it does not do credit investigations and requires only an initial cash deposit, it is helpful for those trying to build credit scores but cannot secure a loan from traditional banks. Yes it is. It has been operating since 2016, and is backed by investment firms such as Silverton Partners, Kickstart, and Techstars. It is also acknowledged by the Better Business Bureau. Self Lender works by lending its clients an amount that is deposited into a certificate of deposit (CD). The client will then have to make timely monthly payments and once the term is done, the CD is released to the client. Depends. Self Lender is a relatively affordable way to start building your credit to enable you to secure a bigger loan in the future. However, it is not free as it has fees and interest rates that you need to pay as well. Yes it is. It is FDIC-insured, so you can rest east knowing that your loan is safe and will be given to you after you have finished paying your loan. No. Self Lender is an alternative loan facility designed to help those with poor credit scores build up their credit rating in a relatively affordable and manageable way. A Self Lender account is an account you open with Self Lender that allows you to avail of their credit-building services. All your transactions, including your initial deposit amount, will be recorded and viewable in your Self Lender account. Yes it does. In fact, the Self Lender mobile app is available on both iOS and Android platforms, making it accessible to a large number of people who might be looking for a credit building service. You do not need to cash a Self Lender check. Your approved loan amount is deposited in a Certificate of Deposit (CD) that is under your name. Once you completed the payments, the money will be released to you in 10-14 days in your payout method of choice. Depends on your needs. Self Lender loan amounts start at $525 and goes up to $1,700. Admin fees and interest rates go up as well corresponding to the loan amount. If you have a tight budget, it might be best to start with the lowest amount and build up from there. Self Lender is a relative newcomer to the alternative loan industry, as it only started its operations in 2016. However, aside from competitive rates, it’s also among the first fully-online credit building services available. Yes it does. Since Self Lender starts with relatively low amounts, it is a good way to build up your credit score in a 12-month or 24-month period. Technically, you cannot apply for an extension for loan repayments in Self Lender. If your payments are late by more than 15 days from your monthly due date, you will just be charged an extra $1.25 to $7.50, depending on your loan amount. As Self Lender is a credit builder loan, you will get the loan amount after you have paid the entire loan term. You can choose from either a 12-month or 24-month term, depending on the loan amount. Payments are posted immediately in your transactions history with Self Lender. However, all payments are only credited on the current month. Any overpayments will not be credited as payment but will be deducted from the principal amount. Self Lender gives clients until 15 days after the monthly due date to make their payments, after which, they will be charged a late payment fee. Yes you can, and you can do it anytime. You can pay a one-time amount and you will receive the loan amount immediately, together with any accrued interests. After you have finished paying the loan term if your choice, Self Lender will release the loan amount to your payout method of choice in 10-14 days after your last payment. Self Lender will give you your money depending on the kind of payout method you choose. You can have it deposited to your account or be given as check. This will only happen, however, once you finished your payments. No. Self Lender only credits payments on the current month due. You cannot pay in advance for the following month, as your overpayment will just be deducted from the principal and will not be recorded as a monthly payment. In order to open a Self Lender account, you will need to be 18 years old or older. You’ll also need to have a bank account or debit card, email address, mobile number, and social security number. Yes, it is. Self Lender is legitimate is backed by known investors. It is also insured by FDIC. After you complete your payments to Self Lender, you will now be able to access your loan amount that was deposited into a Certificate of Deposit, together with any accrued interest it may have. No. A subprime loan refers to a type of loan that offers higher interest rates due to the borrower’s bad credit history. Self Lender, however, is a credit builder loan that does not give money outright, enabling it to have relatively low interest rates. Lean how Self Lender can help you improve your credit scores and how it reports your payments to various credit bureaus. No. Since Self Lender does not give you cash outright like a traditional loan facility, it does not pull up your credit history. In fact, it is designed to help those with rather poor credit histories to build their credit scores. The credit scores posted on Self Lender’s credit monitoring service is based on the Experian/CSID algorithm, which is different from FICO that’s used by 90% of lenders. While this is accurate, it may be different from the score that lenders will use to assess your credit rating. Self Lender reports to the three major credit agencies (Experian, Equifax, and TransUnion) each month of your payment. However, the agencies typically take around 60 days to post the payment in your credit report. This will depend on your particular credit history. Self Lender provides a maximum of $1,700 per loan account. If your credit history is relatively good, it will have a huge impact outright. But if you have much bigger loans in the past, it could take a while to build up you credit score. Yes, it does. The main advantage of Self Lender is that it reports to three main credit agencies your monthly payments. For as long as you pay on time, this can go a long way in increasing your credit score. Self Lender reports to the credit agencies after each of your monthly payments. A regular, on-time payment habit will then lead to a good credit report and eventually increase your credit score. No. Because you are not given the money or loan amount outright, having a credit builder loan with Self Lender does not affect your credit utilization percentage. One of the selling points of Self Lender is that it reports to three of the biggest credit agencies in the country in Experian, TransUnion, and Equifax. This is really helpful for people that are really trying to get their credit ratings up. Yes, but only if your payment is late by 30 days or more. If you pay after 15 days but before the 30-day deadline, you will be charged late fees but it will not be reported to the credit agencies. No. 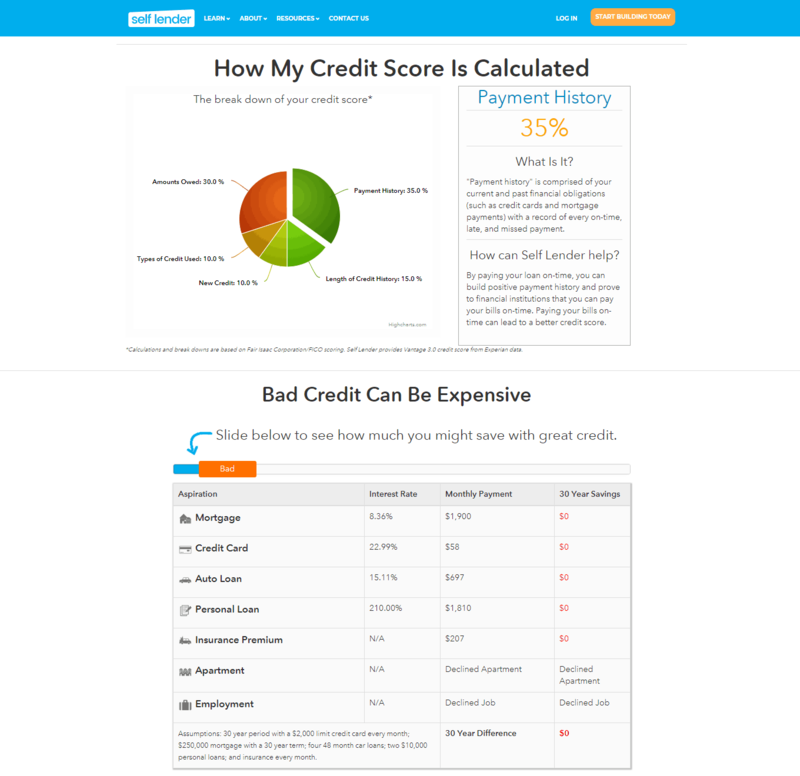 Self Lender only posts one credit score that is based on the Experian/CSID algorithm. It is different from the one used by many lenders (FICO score) but it can also be a good measure of your credit score improvement.